Reid Bandy replacing the bottom structure and topside frames in his Rybovich 36 (11m) Timid Tuna. The arched frames aft will define the new tunnel, necessitated by the change to single-engine propulsion. Drop into the Rybovich yard today and you’ll find a well-appointed and -run superyacht service and refit center (see Comments in PBB No. 143, page 3) but none of the obsessively focused development of custom sportfishermen that defined the original boatbuilding company and made its name iconic enough that investors could justify pouring millions of dollars into a new yard and real estate development around it. 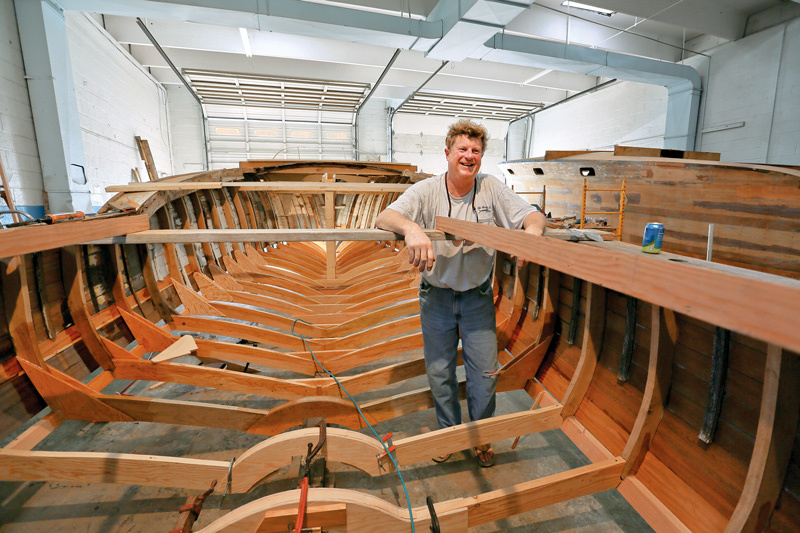 The investor-owned Rybo­vich quit building new boats in 2010. Anyone looking for a Rybovich today has two options: Call on Michael Rybovich and his son Dusty, who are building new custom sportfishermen in their own shop, Michael Rybovich and Sons, in Palm Beach Gardens; or look to the used market, where sumptuously refit boats are listed for millions, and only older models in need of significant attention can be picked up for south of $100,000. The low-budget end of the second option was the choice of Reid Bandy, owner of Bandy Boats in Annapolis, Maryland. An avid sport fisherman himself, Bandy owns a 53‘ (16.2m) Jarrett Bay that he fishes and charters, and over the past 20 years he has designed and built a range of smaller custom fishing boats in composites for similarly fish-obsessed clients. He had admired Rybovich boats from afar for decades, never thinking he would own one, but in 2015, while recuperating from shoulder surgery, he was noodling around online looking at sportfishermen for sale and spotted two 36-footers (11m) from the 1950s that were, for all practical purposes, derelict and dead affordable. 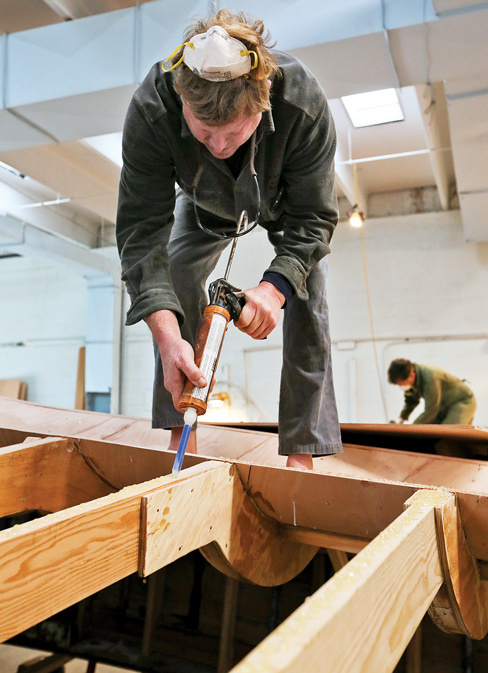 The fearless boatbuilder in him, likely enhanced by some post-surgery boredom and painkillers, spurred him to call his friend Mark Hall, a skilled building contractor and trained boatbuilder, who lives nearby. Hall was interested, so the two flew to Palm Beach to meet the boats’ owner, Bob Bingham, who had been a longtime builder at Rybovich, and in recent years has collected and held older models in hopes of finding new owners for them. The first boat they saw was hull #12, Butterball, launched in 1954, and fairly well preserved. Indeed, of the four Rybovich boats he had at the time, Bingham had started working on this one, reframing and refastening the hull, replacing the transom and bulkheads, and cold-molding a new bottom. “It was coming out of the ashes and Mark was enthusiastic,” Bandy said. Then they went to look at the remains of hull #18, Timid Tuna, launched in 1955. Her condition was dire, but Bandy and Hall ended up paying Bingham $9,000; $6,500 for Butterball and $2,500 for Timid Tuna. Bandy justified the investment as a professional education opportunity. “Even if I had to throw it away, I’d know how they were built,” he said. They shipped the two hulls to Maryland on a couple of low-bed trucks with one housetop, a flying bridge, and other extraneous materials piled on and shrink-wrapped. 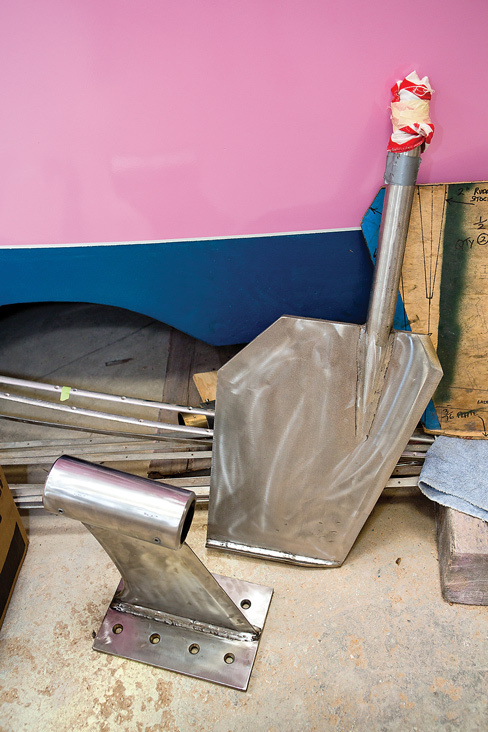 Bandy credits Bingham with meticulously saving and storing all the parts and components from the original boats that would be needed for a restoration. 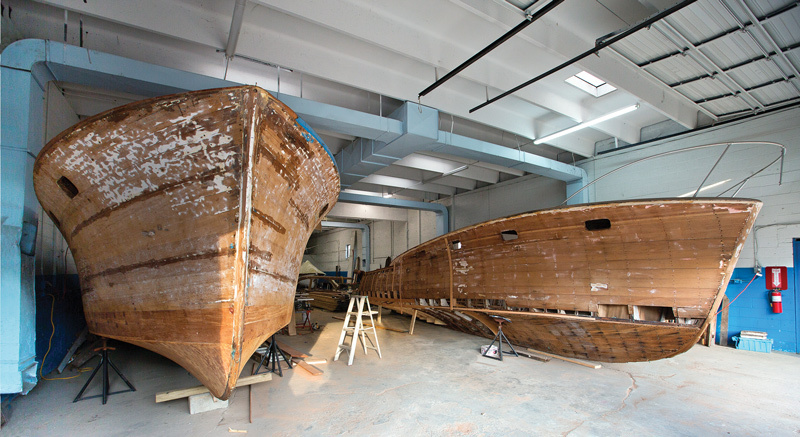 Because the boats had been almost identical and would be restored side-by-side, “Bingham made sure he gave us one each of all the critical curves,” Bandy said. 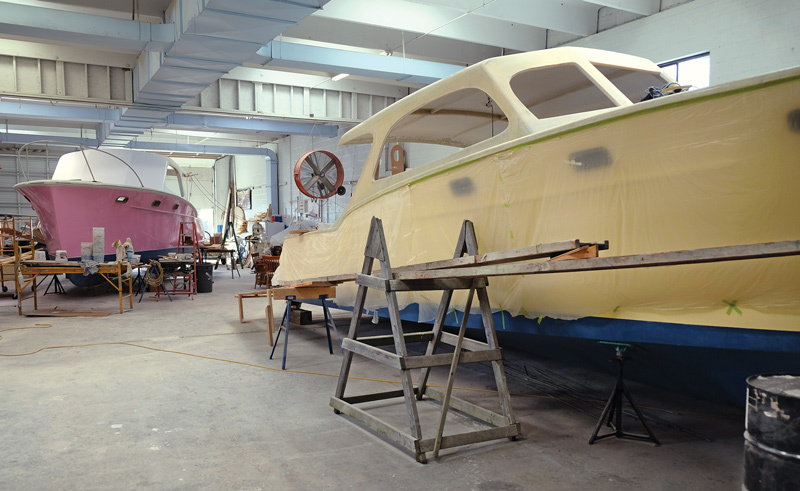 When the boats were unloaded at the Bandy Boats shop in Mayo, Maryland, their condition became clearer. Looking at bungs and fastenings, it was evident that Timid Tuna had been reframed multiple times over the years. There were multiple gaping holes in her topsides, and green vegetation growing on the hull. Timid Tuna, with her hull restored to the historically correct pink finish, is fitted with a modern Corecell-and-fiberglass deck and cabin structure. The 1950s-vintage twin Rybovich 36s Butterball, left, and Timid Tuna arrived at Bandy Boats (Mayo, Maryland) in derelict condition. Butterball had been fitted with a newly cold-molded bottom. Following what he’d seen Bingham do, Bandy first stabilized the keel shape with construction lumber and then jacked the hull back into shape where it appeared to have distorted. After stabilizing the planking by screwing laths to it from the outside, he removed the chine, and starting from aft, he pulled one frame at a time, using them for patterns to cut new ones. He replaced all but 11 frames in the boat, using Douglas-fir below the chine and oak from chine to sheer, and replaced the chine logs and refastened the topside planking as he went. With both hulls stabilized, they turned them over to work on the bottoms. Bandy said he needed to replace the original keel in Timid Tuna, as it was broken in multiple places, twice under the original fuel tanks. (Interestingly, her original laminated stem was perfectly sound.) But he was also planning to depart from the Rybovich design in the underwater shape and configuration. Originally designed to be powered by twin gas engines, the hulls carried their sharp keel and variable deadrise all the way aft. In that configuration, any protrusion of the engines or exhaust risers above the cabin sole could be concealed by built-in furniture in the cabin. Twin 331 Hemis were original 1950s-vintage operating equipment, but Bandy and Hall wanted single diesels. 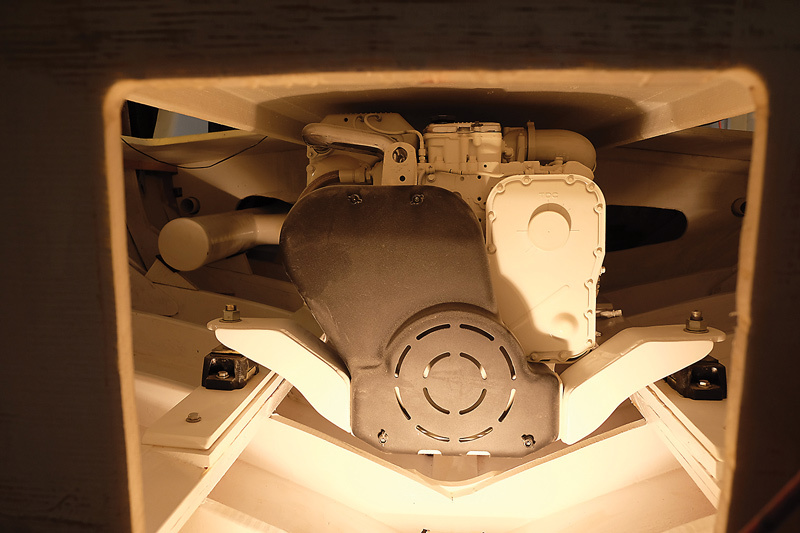 Aside from the obvious benefits of durability, safety, and reliability, the single diesel would also allow for the engine weight to be located lower in the hull. The height constraint imposed by the distance between the bottom of the hull and the cockpit sole was 38“ (97cm), tight for the kind of horsepower Bandy wanted to install. Some online research led him to conclude that there was just one powering option for these boats that satisfied his size and weight-to-horsepower requirements: the Cummins QSC 8.3. Bandy said the old small blocks probably weighed 850 lbs (356 kg) each, while the Cummins coupled to a ZF 286 transmission weighs in at about 2,300 lbs (1,043 kg), delivering up to 600 hp (448 kW). More important than the weight difference was the switch to a single propeller. This required more than just beefing up existing drivetrains to handle a 100-hp (75-kW) jump in power. Bandy drew on his previous powerboat design work and significant on-the-water experience to redesign the afterquarter of the classic Rybovich hull bottom. He started by modeling the full hull shape in Rhino software and then applied Dave Gerr’s best practices to create what Bandy called “a very simple pocket” as a prop tunnel amidships. With the propeller thus recessed, he found he could fit the engine in with a modest 3.9° shaft angle. Making the plan was one thing, but the change to the hull was far from simple. The chine remained the same, and the deadrise to the keel was consistent with the original. “But the last third of keel was removed for the tunnel,” Bandy said. When he replaced the frames in that aftersection, he built in the radius of the tunnel as he’d designed it, supporting the curved fir sections with plywood gussets. Upside down, it looked as if the last 7‘ (2.1m) of the keel had been scooped off the boat with a giant melon baller. The Cummins QSC 8.3, nestled in the bilge on the new stringers and custom hangers, had to fit in a height-restricted 38″ (97cm) space. This was the first point at which the rebuild was not simply a matter of re-creating the structures the way they had been in the 1950s. For the Rybovich, he has a 28“ (71mm) four-bladed propeller. With the 2.48:1 reduction gear and 3,100-rpm motor, he estimates tip speeds to be 12‘ (3.7m) per second. In Rhino he was also able to recalculate the hull buoyancy, as the tunnel actually reduced the displacement and thus changed the trim and waterline. Placements of the engine and tanks were adjusted to trim the boat based on her altered buoyancy. With the tunnel design worked out, Bandy attacked the bottom, cold-molding two layers of 3⁄8“-okoume plywood with a layer of Saertex 17-oz bi-­axial fiberglass between them. He glued the inner layer of wood to the frames with WEST System Six10 thickened-epoxy adhesive. (He shot many of these premixed cartridges in the two rebuilds.) The glass and second layer of the okoume were wet out with MarPro low-blush laminating epoxy. The layers were temporarily screwed to the frames that define the concave bottom form while the epoxy cured. The tight radius of the tunnel required application of more thin laminate layers. Bandy cold-molded four layers of 6mm- and two of 9mm-okoume plywood into the tunnel. Bandy runs beads of WEST System Six10 thickened epoxy on the bottom frames in preparation for the first layer of the cold-molded okoume plywood that would form the boat’s running surface. Multiple layers of 6mm and 9mm plywood were cold-molded into the tight radius of the tunnel Bandy designed. The veneers were temporarily screwed to the frames while the epoxy cured. On Butterball Bingham had started the cold-molded bottom in diagonal layers of fir plywood before he sold Hall the boat, so the work on her to this point was confined to cutting out for the tunnel, framing it, and cold-molding it to the same schedule as on Timid Tuna. With both boats at a similar point, Bandy and Hall turned to repairing and fairing the topsides and sheathing the hulls. Bandy said the old mahogany planking had been dried to between 5% and 7% moisture content by this time. All the paint was stripped off, and the inside of the planking was fully saturated with epoxy. Holes were filled with thickened epoxy and wood replaced where needed. 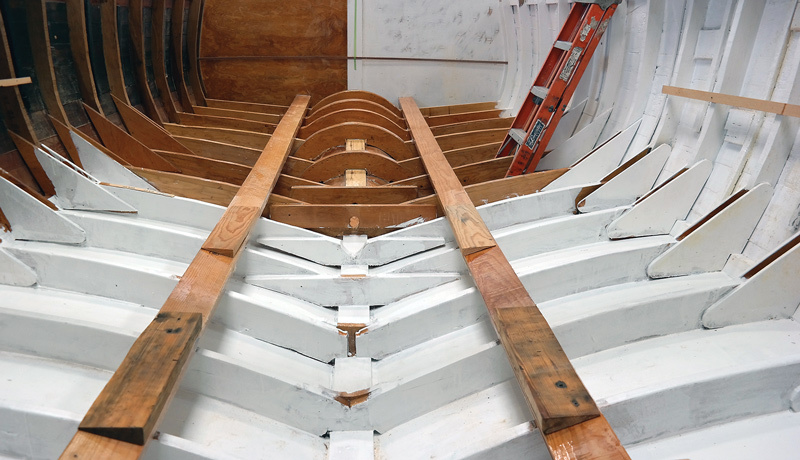 On Timid Tuna Bandy built a new plywood transom and sheathed it in fiberglass before the rest of the hull. “I wanted to glass the transom first so the bottom layers go over it and avoid hydraulic pressure when you’re running,” he said. Those bottom layers are all 17-oz fabric: one 0/90 and two 45/45. The topside sheathing is two 17-oz plies. Bandy said he installed generous 6“ (152mm) overlaps at the chines, keel, and tunnel edges. He’s seen enough hydraulic delamination on boats he has repaired to not want to take chances with laminate edges. Fairing only with a grinder and soft pad—his preferred method—Bandy removed excess epoxy and prepped the hull for painting. He eschews the excessive use of fairing compound, especially on an old boat like Timid Tuna. If someone wants to give her a perfect finish someday, they’re welcome to take the trouble, he said. 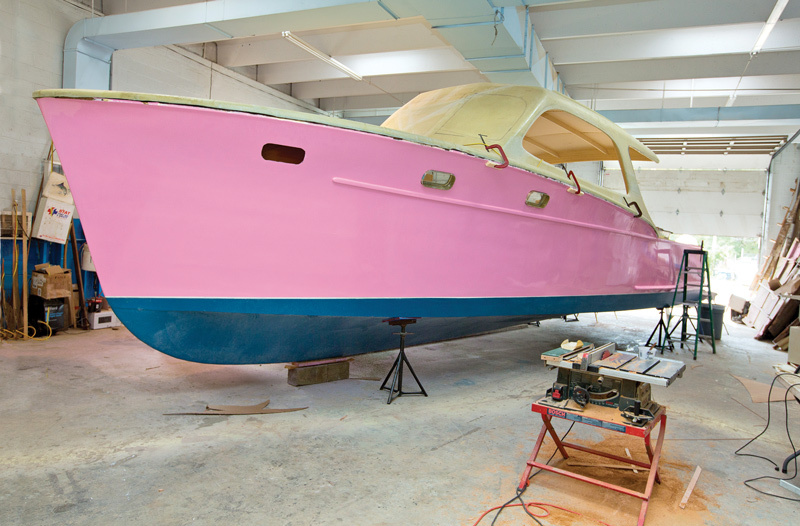 For the rebuild he shot barrier coats and Awlgrip High-Build Epoxy Primer for filling the fabric, then finished with three coats of pink Awlcraft 2000, a close match to the boat’s attention-grabbing original color. 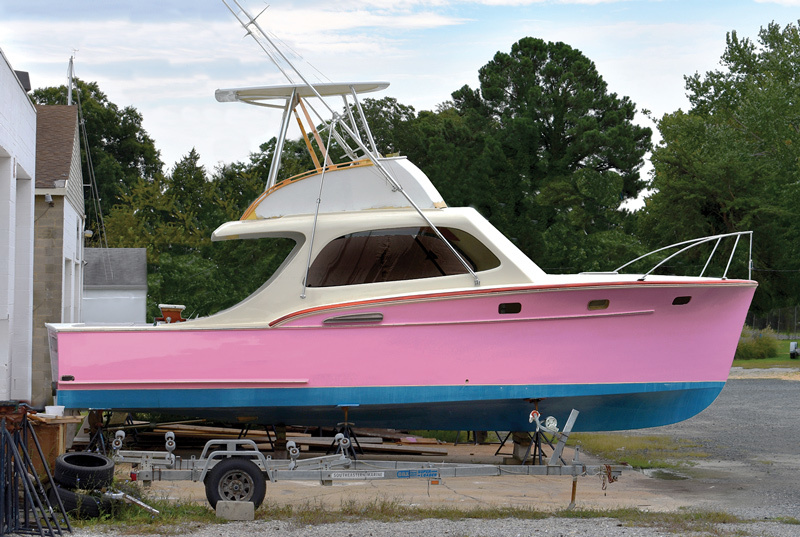 Following several barrier coats and high-build primer, Bandy shot three coats of the distinctive pink Awlcraft 2000 to finish the hull. The new stringers and tunnel await placement of the engine and shaftlog. Butterball was subjected to the same sheathing process, with a few variations in laminate particulars, and a slightly more subtle Fighting Lady Yellow finish coat. Bandy noted that the increased stiffness in the hulls was evident as they were turned over again for mechanical installations and interior work. From the loose assemblage of parts that had arrived, the hulls, at least, had been transformed into monolithic structures. Certainly the ample fiberglass sheathing and cold-molded bottoms contributed to that, but Bandy had also beefed up the scantlings of the frames he’d replaced from 1“ x 3“s to 2“ x 6“s. “We knew we wanted to go 35 mph in boats designed to go 25 mph,” Bandy said. And after consulting with composites expert Al Horsmon, he set a goal of a 40% increase in strength and stiffness. Attaining that goal continued as they built interior and deck structures. Wherever a fit or angle seemed questionable, Bandy defaulted to the Rhino renderings and would go back to the hull to make it true to the plans. “Making the Rhino model my bible was critical,” he said. From those angles he created accurate plywood versions of the steel engine-mounting hangers he would need. He sent those, along with patterns for most other fabricated metalwork required for the project including a custom six-sided rudder and strut, to Jeff Hathaway at Hathaway Marine in Manteo, North Carolina. “I took him plywood templates. He gave me back beautiful stainless pieces,” Bandy said. The stain­less steel components were fabricated by Hathaway Marine (Manteo, North Carolina). 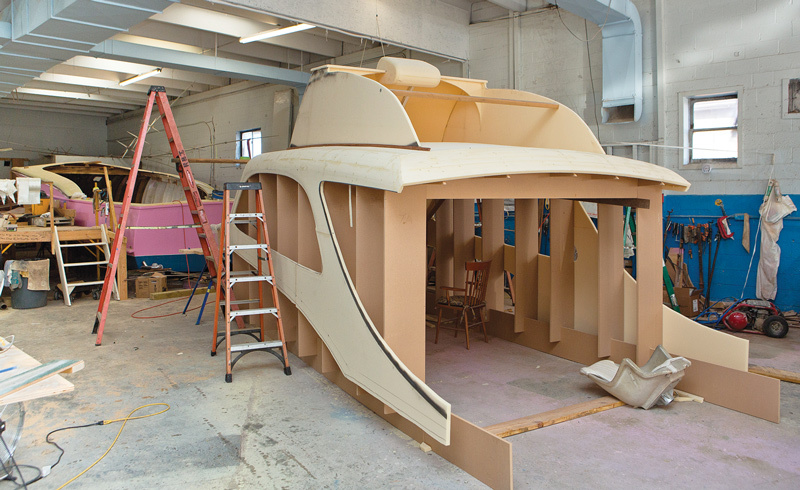 Bandy based his designs for the plywood rudder and strut patterns seen here on past experience designing his own Bandy 35 (10.7m) sportfisherman. With the engine installed and the 240-gal (909-l) fuel tank in place, Bandy set to work on the cockpit sole, accommodations, and cabin house. His comfort with modern composites came to define this part of the project. To make the boat lighter, Bandy built all the secondary structures he could of Corecell structural styrene acrylonitrile (SAN) foam. Working almost entirely with 1“ (25mm) stock between laminate layers of 17-oz 45/45 and 0/90 fiberglass, he installed transverse frames and bulkheads; built a sealed cockpit sole with a slight crown; a curved foredeck; a complex cabin structure, including some furniture; and a flying bridge. The sole was straightforward construction on the shop floor, applying two layers of glass to each side of the foam, running foam stringers on the bottom side, and sealing the edges with glass tape. Those stringers are 42“ (1.1m) apart and correspond with overlaps of laminates on the top of the deck, which Bandy says makes a nice structural element. 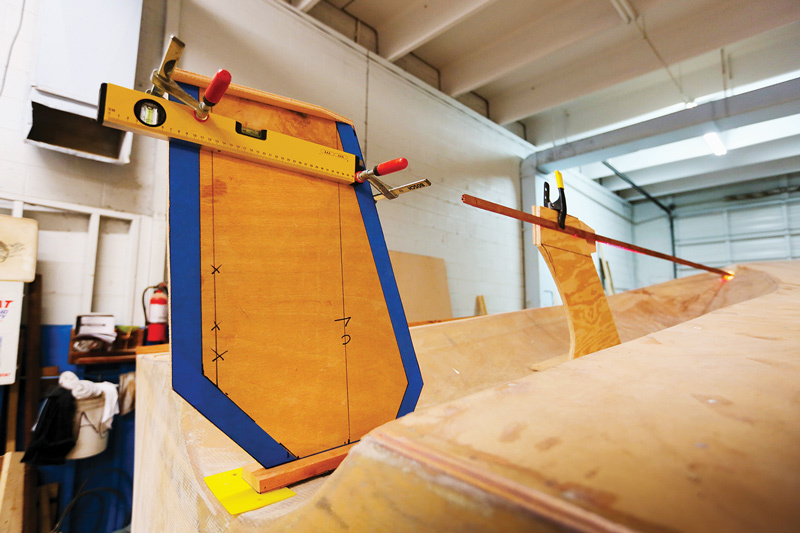 Installed in the boat, the sole is glued to fir cleats that run fore-and-aft, spanning between frames, to which they are mechanically fastened. This interface between the wood structure and the composite allows the latter to be fully supported. On the foredeck Bandy used the original structure as a mold for the new. Because he wanted more camber, he laid a couple of stringers on the old deck and let the Corecell drape over it, naturally forming the crown that Bandy was looking for to add some headroom below. He hand-laid the top laminates right in place and then turned the structure onto the shop floor to glass the underside and install stringers. Meantime he removed the old foredeck, leaving a 4“ (102mm) flange of original material to glue the new deck to. That hull-to-deck joint was then reinforced from the top with fiberglass that lapped onto the hull laminate. For the house structure Bandy digitized the original they had from Timid Tuna, which turned out to be 6“ (152mm) longer than Butterball’s had been. 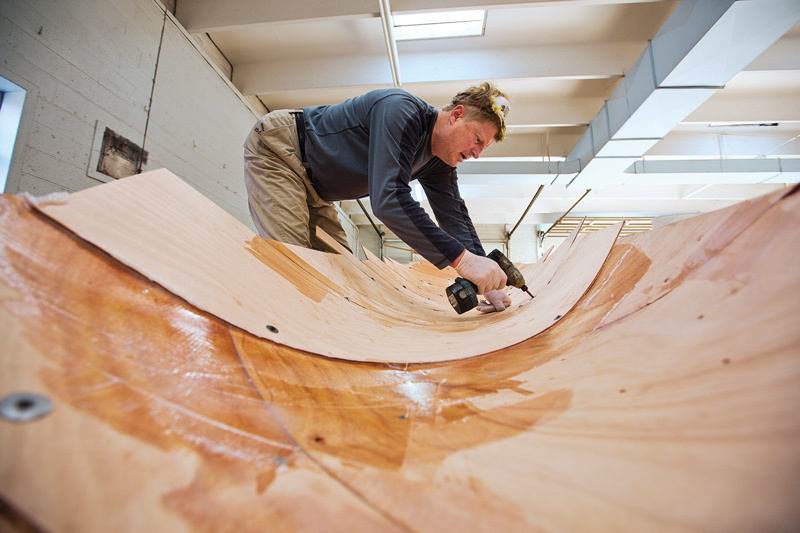 Working on a jig cut by a CNC router, the house structure re-creates the Rybovich curves and proportions almost perfectly, though Bandy added 7“ (178mm) to Timid Tuna’s cabin height to accommodate his own tall frame, and raked the sides in slightly. Pulled from the jig, the inside of the house structure was glassed on the shop floor, and reinforcements and stringers were added before installing the entire unit on deck. The crowning detail of the rebuild in modern materials is the flying bridge. Made as a slavish copy of the original in form, Bandy replicated the streamlined steering pod, but in Corecell and fiberglass, not mahogany. Similarly he re-created in foam sandwich composites the signature Rybo­vich arched mahogany handrail and trim piece that defined the curve of the flying bridge side. That, he conceded, was going to require a lot of fiddly laminating to finish. The lines for the new house were taken off the original from Timid Tuna, tweaked in Rhino, and realized in a CNC-cut mold used as the form for structures on both boats. Bandy sculpted the Corecell foam to replicate the original curves and styling of the Rybovich structure, including the steering pod visible on the flying bridge. Butterball, foreground, and Timid Tuna with new composite houses installed. Note that Butterball will have her original forward-facing glass windshield restored in the rebuild. As we closed in on the print deadline for this issue of Professional BoatBuilder, Bandy was racing to get Timid Tuna in the water. He’d abstained from fishing all summer as he worked on the Rybovich and a new 24‘ (7.3m) carbon fiber center-console model he’d designed with a very narrow beam and light weight. (“Cruises at 35 knots” with a 90-hp/67-kW outboard, he said.) So the shop has been full of distractions, and yes, it would be late in the season he said, but more than anything, he wanted to test performance and “get some numbers” on Timid Tuna, the classic Rybovich he has fearlessly brought back to life in a much altered form. And in the spring, he’s hoping to see Hall’s Butterball, a much more “stock” restoration, join him on the Chesapeake. Nearly ready for launching, Timid Tuna retains the look if not the materials of a 1950s Rybovich sportfisherman. She’s likely to be faster, stiffer, lighter, and more fuel-efficient than her original incarnation. About the Author: Aaron Porter is the editor of Professional BoatBuilder.